The Snoqualmie Valley Trail (SVT) offers the opportunity to get out and explore one of the most beautiful agricultural valleys in the region. Thanks to Si View Metro Parks, access to the trail from neighboring communities will see new connections to and from King County’s longest regional trail . The soft surface trail runs through the entire Si View Metropolitan Park District and the local agency is actively working on creating safe routes between neighborhood parks, green spaces, and trails. The safety benefits of two new connections will enhance the overall recreation experience and offer greater access to new and returning walkers, bicyclists, and equestrians. Both trail construction projects are currently under construction in North Bend. The first project nearing completion is a short gravel surface connector trail that travels along the Dike Road field on Meadowbrook Farm, a 460-acre scenic and historic public open space managed by the Meadowbrook Farm Preservation Association, making the connection to the SVT at Mount Si Golf Course. The trail improvement features a seven-foot-wide bridge over a floodway area, creating a safe crossing for trail users. 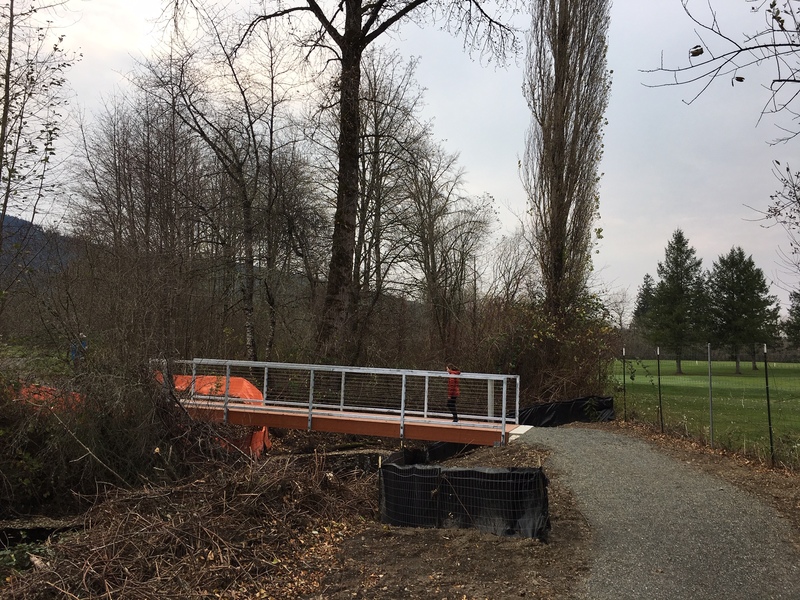 The trail work has already been completed and the last item to check off the list is the installation of a gate where the trail meets with the Snoqualmie Valley Trail. At the nearby Tollgate Farm Park, a 410-acre historic farm property and open space, a connector trail between the park and the SVT is on track to be completed this spring. This new connection will eliminate the need to walk or bike on the shoulder of heavily traveled SR 202 near Tollgate Farm. Pedestrians and bicyclists will enjoy the extra breathing room away from the busy road shoulder. The trail meanders through an inviting lush pasture that leads to a new boardwalk over a wetland habitat area, underneath SR 202, then leads to a ramp that climbs up to the SVT. Once complete, the connector trail will make Tollgate Farm Park accessible for walking field trips from local schools and provide an alternate walking route to North Bend’s historic downtown. 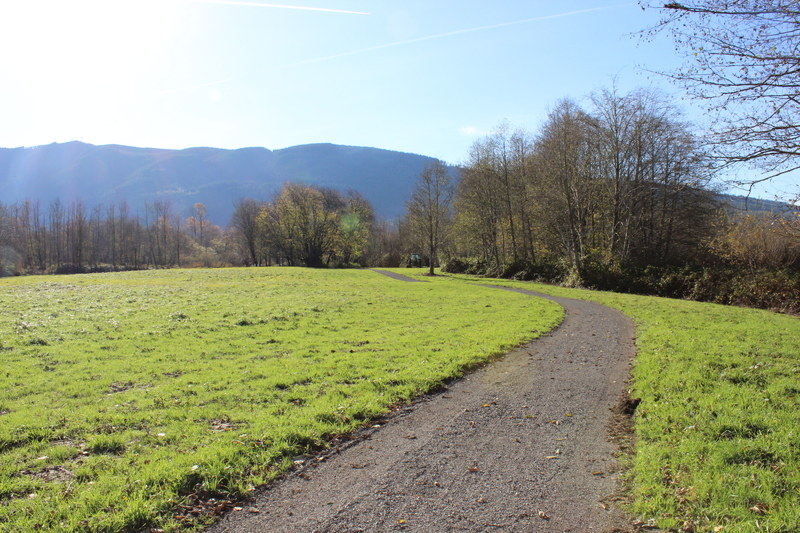 While both connector trails are seemingly small additions to the overall picture of the Valley’s trail network, they will provide safe, enjoyable access to the Snoqualmie Valley Trail. The 31-mile SVT serves as the recreational backbone connecting communities to premiere outdoor activities, local food and farms, rich heritage, arts and culture that you won’t find anywhere else. The expanded recreation choices using the new loop options will add to the array of scenic walking trails that bestow unobstructed views of Mt. Si and the Cascade Mountains. Whether you’re a teacher taking a class on an outdoor learning exploration or a cyclist turning off the SVT and stopping in town for a bite to eat – these small connections add up to great rewards, many of them delicious. Greenway Trust volunteers improved salmon habitat, built trail, maintained tread, and fostered community together this year. From Discovery Park, through the Middle Fork Valley, to Thorp Mountain and beyond, you have left a positive impact.